Considering the reputation that accompanies Ivo van Hove the first thing to be said about his production of Arthur Miller’s famous play is that it’s more restrained than might have been expected. This is not to suggest that it is performed in the shadows of the play’s reputation but rather that van Hove has created a singular work of such potency that despite stripping away external features and focusing intently on the performances, it retains the power of the great naturalistic dramas. Van Hove is a director that appears to relish the challenge of recasting great works in a new light; he is happy to cross cultural mediums and recent work includes the Antonioni Project, which re-enacted the Italian director’s films, and a highly-lauded adaptation of Strindberg’s Scenes from a Marriage. He has demonstrated a desire to bring new perspectives to classic works and this reached its peak with the hugely ambitious Roman Tragedies, which came to the Barbican in 2009. The production brought together Shakespeare’s roman plays and pulled them in to the modern era through an immersive multimedia spectacle that captured the increasingly symbiotic relationship between news and drama in the age of 24-hour reporting. He is also happy working with the great American playwrights having previously staged Eugene O’Neill, Tennessee Williams in New York and now brings Arthur Miller to London. The influence of the director is clear from the moment the audience enters; Van Hove has used the flexibility of the Young Vic’s auditorium to physically conceal the entire set within a black box. Indeed the raising and eventual sealing of the stage suggests a symbolic entombing of the story and hints to its timeless nature. The production strips away all hints of naturalism from the setting. It exists as a stark, white rectangle surrounded by a glass bench. 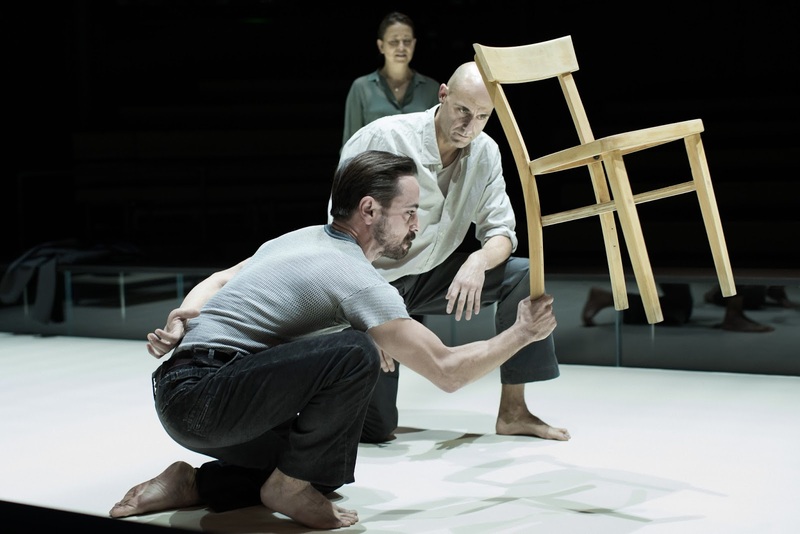 The only prop being a wooden chair that forms the essential test of strength between Eddie and Marco; van Hove recognises its significance and frames Marco holding the chair aloft in a moment of absolute stillness. It is reminiscent of a classical sculpture and is one of a number of markers that draw out the links to Greek tragedy that Miller hinted at within the text. The lack of a setting inevitably directs greater attention towards the actors, and they are uniformly excellent. Van Hove has drawn highly stylised performances out of his cast without losing the grounding in naturalism that is essential for demonstrating the characters’ humanity and for capturing the emotionally draining tragedy that lurks in the background throughout. There is an expressionistic quality to the performances that adds a strand of universalism to the highly specific nature of the plot. Whilst the story of Italian migrants and working-class longshoremen places it within a time and place, this production leaves the audience in no doubt that the deeper themes are those that have always been with us. 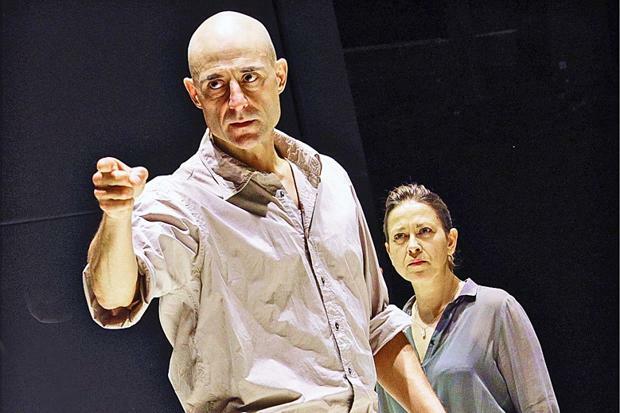 It is anchored by a performance of exceptional power by Mark Strong as Eddie Carbone. He brings a natural physicality to the role that tells a story of sinewy strength rather than bullish power; the famous description of ‘eyes like tunnels’ is entirely apt for his Eddie, this is no knuckle-headed docker, but a man of complexity and internal conflict. We sense that behind those eyes is a torrent of raging emotions that he is intelligent enough to recognise but too inarticulate to express. One of Van Hove’s directorial flourishes is to hint that this conflict goes further than his relationship with Catherine. His inability to handle the growing closeness between Rodolfo and Catherine seems to be more than inappropriateness towards his niece but also containing a confusion of his feelings towards Rodolfo. It is never overtly expressed but the mocking of Rodolfo’s abilities as a dress-maker, as singer and his fascinated obsession with how the other dockworkers laugh at him seem to come from a position of deeply repressed feelings bubbling away under the surface. As events continue to tumble towards their inevitable conclusion, the machismo of the boxing tuition and the scene where Eddie forces himself on Catherine and Rodolfo are given added weight by this unspoken drive. On TV Nicola Walker has a track record of playing wronged wives and usefully draws on that background to produce a Beatrice that inevitably elicits sympathy whilst retaining a question mark over her passivity to the proceedings. She is aware of problems with Eddie, and their conversations suggest she has at least an inkling over his sexual confusion, but does too little, too late to try and intervene in his relationship with Catherine. Phoebe Fox is excellent as Catherine. She plays the role with a certain knowing innocence, and there is coquettishness to her interactions with Eddie that suggests that she is at least subconsciously aware of the hold she has over him. This adds power to her relationship with Nicola Walker’s Beatrice and lends a certain charge to the moment she rages to Rodolfo about Beatrice’s failings as a wife. Eddie and Catherine are highly tactile and without knowing the play it would be difficult to guess their relationship in their opening scene. It is a highly-charged affair and the clear inappropriateness makes it an uncomfortable moment. The staging for it is brilliant and makes full use of the sheer size difference between the two actors to heighten the transgressive nature of the scene and the sense that Catherine, as she has to literally leaps up to straddle him in short skirt, is at least partially aware of her actions. Understanding the language of theatre enables you to map out what will happen in this play purely from that opening moment. When the end comes, as it must with terrible inevitability, it is captured within another of van Hove brilliant directorial interventions; the door through which actors enter the stage, and that has been open throughout, is slammed shut with a shocking finality – the cast are trapped upon stage and the final descent must begin. At 2 hours with no interval van Hove has done a fine job in directing a play that manages to seemingly rattle along at a relentless pace whilst also instilling in a number of moments of serene stillness. The introduction of an opening scene of Eddie showering has a sense of baptismal purification and is bookended with a finale of staggering visual splendour that provides the ultimate catharsis to an evening of rigorously high-quality acting and directing. This is not how Arthur Miller wrote this play but it is hard to believe that he would not have approved. 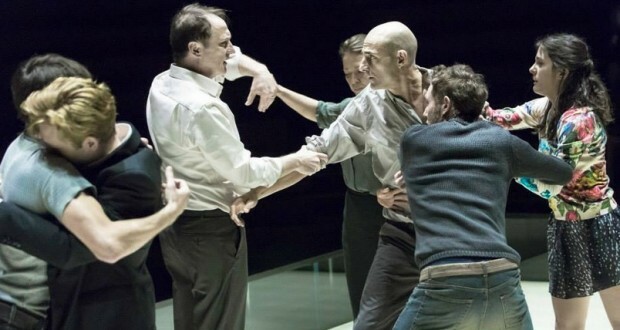 Ivo van Hove has proved once again that there are few director’s better equipped to add new perspectives on classic work and Mark Strong, leading a fine ensemble cast, is currently showcasing a performance of the highest quality and one that suggests his career as perennial ‘bad guy’ in Hollywood films needs a swift reappraisal.